How to make a Weighted Blanket- A DIY Video Tutorial to do at home! Have you looked into getting a weighted blanket? They are pretty pricey to buy, but for a fraction of the cost and a couple hours of your time, you can make a custom weighted blanket to fit your needs and your style! Why choose a weighted blanket? Weighted blankets can be used to help symptoms of depression, anxiety, anger, and stress. They can help you sleep better or be a calming tool for people who are on the autism spectrum. Chances are if you are looking for a tutorial on how to make a weighted blanket, you already know that it might help you! I’ve made them for many people and every time I have heard positive results. I have trouble falling asleep at night, I just lay there and toss and turn. Last night I tried the blanket that I made for this tutorial. I feel asleep almost instantly and didn’t move at all! I am a believer! Disclaimer: I am not a doctor just a Mom that knows how to sew. I made several of these blankets for my family and friends. At the bottom of this post, I have attached a video tutorial for any of you visual learners. A few years ago I wrote a tutorial post on this subject that you can read DIY weighted blanket tutorial. If you don’t have time or the resources to make one of these, I recently found an amazing price on an already made weighted blanket that ships free with Prime! Check out this already made weighted blanket here*! Although, I highly recommend making your own if you can because you can personalize it to fit your specific needs! 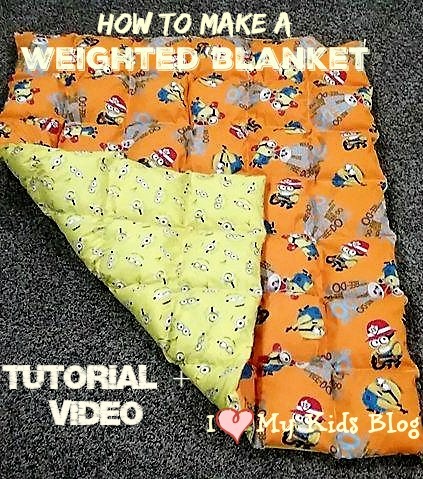 Before I jump into the video, here are some basics you need to know about making a weighted blanket. You’ll want to start with a plan. Determine what size blanket you want. You can use an existing set of sheets, or blankets you already have, or you can pick out some awesome fabric that fits your style. Just remember that you need two sides to the blanket. For this particular blanket I wanted it to be just over 50 inches so my nephew will be able to use it for a few years before we need to up the length and the weight. He wanted two different sides so my sister bought a yard and a half of fabric of two kinds. I go over the details in the video on how to determine how many pounds of poly pellets you need. The general rule is 10% of the person’s body weight. Materials needed to make a weighted blanket & where to get them! I have searched and searched for the best price on poly pellets. Ebay seems to be the best place for them. Sometimes you can score an awesome find and get them for $1.50 a lb. Lately, I best price I have found is $1.94 a lb HERE is a listing for them, what I like about these specifically, is tells you it can handle up to 250 degrees, so you KNOW these will be machine washable and able to dry in your dryer! You can also get them on Amazon, they are more expensive but you can get them with prime shipping. $2.50 a lb is the max I like to spend on these. If you are in the market for a new sewing machine I LOVE my Singer Confidence machine. I have had it for 6 years and it still is running awesome. It has loads of cool stitches and has been very reliable! Now that you have all your supplies, here is the video that shows how to make them! Please leave a blog post comment and I will try to help answer any questions that I can! Enjoy the video tutorial! You can also watch in in full resolution on YouTube by clicking here. So how do you wash this blanket? It should go through your washer just fine on the gentle cycle if you have it. It will be VERY heavy in the washer. As long as you use poly pellets that are heat resistant, then you won’t have trouble if you use your dryer’s lowest heat setting. If you are worried at all, you can head down to your local laundr-o-mat and use one of their giant machines to wash and dry it! Another idea is to use waterproof shower curtains to sew the “blanket” and then make a cute fabric duvet cover type thing to make it cute. Then when it needs to be washed, you pull it apart and wash the fabric and hand wash the waterproof “blanket”. Thanks for reading and watching today! Please leave a comment if you have a question and I will try to get back to you right away! Disclosure: Affiliate links are present in this blog post. I just made my first weighted blanket using your tutorial. Very easy to follow and thank you for posting a video too! Now I want to make a few more for myself and other family! Thank you!! That makes my day! I want to see it! Can you post it to our facebook page? Sorry I’m not a sewer so I’m a bit confus d. Did you put batting in all the pockets and just added pellets to the center ones , leaving the end pockets on all sides with just batting? This is very helpful. Thank you so much. I am making one as soon as I get all the materials. Thank you so much for posting this wonderful tutorial. I am going to attempt to make a weighted blanket for my teenage daughter, who suffers with generalized anxiety disorder. I appreciate all you are doing to help others! God bless you! How did it go Debbie? Getting ready to make my first one for my 6 year old grandson. I wonder how it would be to make a “little pocket” out of quilting batting, pour the pellets in, stitch it shut, and then put that in each pocket of the blanket. I thought maybe the pellets would be more stable and I could measure and get these ready ahead of time. Would like to know your thoughts–pros/cons of this method. Thanks, and thank you for the tutorial! I think it is worth a try. I can see the pros being able to sew with less worry of sewing over a pellet and breaking your needle. I like the idea that the batting pockets would be stable. My only worry is it would add quite a bit of time. To cut your batting squares, stitch them, fill them, stitch the top. In the over all scheme of things, I think it would maybe add 30 or so minutes, so I’d say give it a try and if you do, let me know how it goes! Thank you for this lovely tutorial, I am concerned about washing and drying, will the batting or fiber fill gunk up into a clumpy mess once it is wet? I am considering making four blankets for my two sets of twin grandchildren (yes, same mommy and daddy) !!!! ???? You have done a beautiful job here, so much appreciated! God bless! Actually, I have a question. My grandson is usually very warm and I was wondering if I could leave out the polyester batting. Have you ever made one of these blankets without the polyester batting and only filled with poly pellets? I was wondering the same thing. My daughter gets really warm at night but could really benefit from a weighted blanket. I’m not sure what to do! My daughter has one and I find that it stays cooler than a traditional comforter. Maybe it’s the way it’s sewn allows it to breathe better? Not sure, but it’s nice and cool in the summer time. I have the same question! Does the one your daughter has have the batting in it, or is it just the beads? I have done that before, it isn’t as soft but it fulfills it’s purpose of weightedness! What a nice plant l loved it great job! Your tutorial is extremely clear and makes this project easy. I appreciate the time and care you put into making it! I’m making it for myself as I suffer from insomnia and fibromyalgia. I used two cotton twin sized flat sheets and cut them to the dimension of 40 x 60 inches (I am 5’2″). I did not use the batting because I, of course, have hot flashes! This keeps the blanket less heat insulating. Thanks so much! You are so welcome Robin! Glad it helped! Do you prewash your fabrics? thank you for this, i was considering making one for my son but i was so scared i havent sewn anything in years and do not really remember how, plus the whole idea of the project scared the bejeebers outta me…then i saw weighted blanket prices and decided this was my only option lol..your post and video have made me extremely confident now and i know i can do it thank you so very much for this!! I’d love to hear how it went! Thanks for a great tutorial! I have my pellets and machine ready to go! How heavy did you make the adult blankets for sleeping? Did you leave unweighted squares on the outside rows? I’m making one for my teenage daughter’s friend to sleep with, and I want to get it right! Thank you!! I am glad you liked the tutorial! You should use 10% of the adult’s body weight., so if they are 200 lbs, the blanket would be 20 lbs, I would not exceed 20 lbs for any blanket because the weight will rip out the stitches. What a great person you are to do this for your daughter’s friend! I do prefer to leave unweighted squares on the outside rows just so the weight will be on the person rather than on the bed. Keep me posted on how it goes! Thank you for taking the time to share how to do this along with your tips and tricks! I’m going to attempt it. Wish me luck! You’re welcome, good luck, you got this! I have quilt batting and instead of using fiber fill I was going to stitch that ahead of time. Any tips? Just stitch it onto the back like a quilt sandwich but without the top? That is what I’d do! Hi there, my daughter has just asked me to make a weighted blanked for my grandson and am looking forward to the project. Are there pellets in the top row? I know you didnot put pellets put the outer pockets, just wondering about the top. Great tutorial. Thank you for sharing. I know I already replied via direct email to you, but just in case others are reading this and have the same question…yes the top row has pellets! Is there a recommended stitch you use to sew this or a standard stretch stitch? CJ! I really enjoyed watching this and learning from you how to make one of these blankets. Your tutorial was fun to watch(I loved your little comments about your 2 yr old and about maybe you’ll iron, maybe not-I sew that way too) Thank you! I was confused? Did you use pelt in each square? Can you use beads instead of pellets? Hi Darlene, I know I already replied via direct email to you when you posted this, but just in case others are reading this and have the same question…You could use beads, but make sure they can stand up to the heat of the dryer. That would be my only concern. Thank you so much for this tutorial! I have one son who suffers from SPD, and another with anxiety. I just can’t afford buying two weighted blankets!! I have a question, though, and can’t find much information online. How warm do these blankets get? I have one son who is always cold, and the other who is always hot. I’m really uncertain whether to put the stuffing in, and if I do, how much? Do the pellets make them warm enough on their own, or do they need the extra stuffing? I want these to be used year round, but worry my boys will be too cold in the winter and/or too hot in the summer. Any advice would be greatly appreciated! Hi Jana! I know I already replied via direct email to you when you posted this, but just in case others are reading this and have the same question… The more stuffing you put in the warmer they are. Every person regulates heat differently so it is a tricky question to answer. You definitely can make these without batting for the son who gets warm easily, it won’t be a soft but it will do the trick and help him to stay cooler. If they get too cold in winter, just toss another blanket on top! I know I already replied via direct email to you when you posted this, but just in case others are reading this and have the same question…I have never had one shrink after washing and yes put it in the dryer in low heat setting if you have it! OOO I want to see them all! Share on our Facebook page!!! Is the blanket washable? Can it be dried in the dryer? I know I already replied via direct email to you when you posted this, but just in case others are reading this and have the same question… As long as you make sure you are using poly pellets that hold up to heat you should be fine. they wash just fine, but are SUPER heavy in your machine. You can tumble dry on the lowest heat setting your dryer has! What is the face book page? If I were to use a single “sheet” of batting rather than the pull apart kind, would I sew in 2 layers when sewing the front and back 3 sides together OR would I sew and turn right side the front and back and then slide a layer of batting in prior to creating the individual pockets? I’ll be making one for my 31 y.o. daughter who deals with ASD, anxiety, PTSD and depression! I know I already replied via direct email to you when you posted this, but just in case others are reading this and have the same question… You could do either but I think easiest method would be to put your fabric right sides together, put the the sheet of batting on top of the wrong side of the top piece (whew, still with me, this is confusing!) sew and flip inside out. might be easier to google a video on how to do it ha ha! This was awesome! You broke the steps down so that I can try to make one. Thank you so much ? I am getting ready to make a weighted blanket for my grand daughter. The one question I saw a few times but did not see an answer to was about washing the blanket and if the batting bunches up. I had seen another tutorial on another site and they did not use batting. I love the batting idea for coziness and warmth but am a bit concerned about bunching. Thank you for making this wonderful tutorial…it is a life saver! Hi Pamela! I’m sorry, I’ve tried to answer all the questions I see. Sounds like I need to go back and look! I have never had a problem with the batting bunching up. If it did, I’d guess you could pull it apart on the outside of the blanket. I just machine wash and dry on low heat setting. Keep me posted! Mary, Absolutely! It would be adorable! I can envision a cute rag quit type blanket…my problem is, the last time I quilted my home ec teacher told me I should never touch a sewing machine again and most definitely should never quilt. it left a bad taste in my mouth for quilting. I barely squeaked by that class with a C-. haha! If she could only see me now! making sewing tutorials…well if she could see me she’d shake her head at me skipping the ironing part. ha ha! Thank you for posting this. In the past I’ve made many double sided flannel, or quilted & flannel, light weight blankets for babies or toddlers. (Actually one child kept his until way past toddlerhood). I would agree that after you sew the first 3 sides, & turn it right side out–it should be pressed. Now you can top stitch the outer three sewn edges. That way–when you sew the top edge closed at the end–all sides match, & all sides are reinforced. Sewing is fun! you should! What excellent suggestions!!! I am so glad to hear it went well! I will definitely be making some of these blankets. Your tutorial was great. The only thing I would do different is I would sew up both seams on the sides and leave both ends open. Once I sewed all of the seams about 7 inches apart from top to bottom, I would then sew a row of stitches in the middle of the blanket from side to side. That way I could fill the lengthwise rows with the batting and poly pellets from both ends. That is worth a try for sure! Good thinking! I might try that next time too! Where do you purchase your poly pellets? I would like to make a 12 pound blanket for myself inexpensively. Would like to make it small enough just to cover myself and not sure what that size should be. Any words of wisdom? Not a seamstress but have an old sewing machine and can sew a straight line. I bet he will love this! Quick question before I begin…i bought a cotton material and muslin for for the backing but then it was suggested that I add batting between that layer and back it in flannel….to add additional softness. Is that necessary? Would it work to use the flannel as the backing instead of the muslin? I think it would be just fine! My daughter-in-law complains of being overheated at night as well as having great difficulty sleeping. Have you made a weighted blanket without batting? Yes, it isn’t as soft but it works just fine still! How much batting did you stuff into the pockets? However much you want. The more you put the fluffier it is! I’m going to try this for two adults in my life – just curious though… what dimensions did you use for the adult blankets you referenced in your You Tube tutorial? Thank you! I used a standard sized blanket that you get from the $5 bin at Walmart. You can make it any size you prefer! Could a cup measurement work as well. This is for my grandson. As long as you make sure the total weight isn’t more than 10% of their body weight. Great video! I will probably sew one for my nephew before Christmas. He is autistic and hopefully this will help him. I think it would be easier to sew one long side and two short initially if I put all the weight in the middle. This would keep me from having any pellets in that last row as I close it up. It also will keep more of the weight across the table as I’m sewing it. I cannot wait to make this for him. Thank you! It depends on how many squares you have as to how much pellets you use for ea square right and if someone weighs 140 I would use 14lbs right? Do you have a suggestion as to size for an adult? Width and length? It depends on how tall the adult is. You don’t want it too big or the weight won’t be on them. We just made this blanket for my 4 year old daughter and it is working wonderfully! I ended up buying the pellets via Amazon.com for the free shipping and paid $9.95 for a 2lb bag and shipping was free. The instructions were really easy to follow and our blanket turned out great. It was FAR more affordable to purchase the items and make it ourselves then to buy one. Thank you for laying out the formulas for the pellet distribution, it was easy to follow and when she gets bigger we will be able to duplicate it for a larger blanket. Thanks for posting! This makes my day! Thanks for sharing!! Worth a try! Would they hold up to water and heat? I want to make one for my friend who is roughly 170 pounds. Would I really put in 17 pounds of poly fill? Yes, I made one for my son this Christmas. He has severe OCD and anxiety as a result. It 8 by 13 pockets and has 4.2 ounces in each of the middle pockets (I left a border with no weight). It is 17.325 pounds — super cool and really heavy. He is going to LOVE it! I can’t wait to give it to him. How did it go Heidi? 17 lbs of pellets. Not poly fill per say. I just finished my weighted blanket. I used a rectangle batting between flannel and cotton wrong sides together and put satin/ polyester blanket binding on the raw edges. Love it! I used a walking foot on my machine to prevent bunching. I’d like to post a photo but don’t see an option. Way to go Helen! I want to see! Can you post it on our Facebook page? Great idea to use your walking foot! I don’t have access to a scale. If 2 ounces of pellets were measured how much would it be? 1/4 cup or 1/2 cup? That measure would help. I loved your video. You make it look so easy. I can’t wait to get started. I don’t know for sure, I don’t even have any pellets to weigh out for you. Sorry! I was wondering if I make a quilt top , would you line it with a solid cotton before adding the pellets ? Also can quilt batting work ? I was afraid the pellets would come out around the piecing. Is there instructions that can be printed? I’m so glad! Thanks for checking out our blog! Have my cotton fabric (here’s where I change it up) line one side with warm and natural than back to your pattern of sewing it up. But only making 5 inch squares and leaving the batting out. I will put the warm and natural side next to me. This way the blanket will not be so fluffy and between not putting pellets on 2 edges and squares being smaller, more weight on me? Think this would work ? Or does the fluff batting do something I’m not thinking of?? Loved you blanket Want to make one for myself you said I could use flannel. I would be making a queen size one. Thank you. Hi, I’m making a twin size weighted blanket for my teen daughter. Do you just guesstimate the amount of batting per square? Approximately how much did the materials you used to make the weighted blanket cost? I’m making weighted lap pads for kids at my school. Your tutorial is similar to the first lap pad I made, but for the second I was trying another strategy which I’m finding more difficult. I’m totally inspired to go back to the first plan- the one you showed here. I have a couple of questions that you might be able to help with. 1) After you filled each column and sewed the row closed did you back stitch at the start and finish? How did you finish off that seam since it ends at the end of the blanket? 2) Any other ideas besides pinning to keep the pellets from getting caught in the needle while sewing the pockets? I am making the lap pads 2lbs which fills the pockets really full and am struggling with keeping the pellets in place so I can sew the seam. I love the idea of making the blankets for kids with the stuffing! It started me thinking about kids in my family that might really benefit from the weight of a blanket. The minion blanket is adorable! 3) How much batting did you use for that size of blanket? How much batting do I buy? I am looking at around a twin size. Can this be done without the batting if you get too hot at night? Do you sell these? I don’t have a sewing machine and do not know how to sew. I am 18 and have severe anxiety and sleeping issues. I would love to get one but can not afford it. Thank for the tutorialI want to make a weight blanket for an adult. the weight of the blanket will be around 22 lbs. Did you choose a particular kind of cotton fabric e.g a very heavy cotton, when you made the blanket for the adult friend? I’m not sure a normal cotton will hold the weight. Hi. I am going to make one that is 20 lbs. How much fabric should I buy? Thank you! how tall is the person? You want to make it their height unless they are still growing then you want to make it a bit longer so they can grow into it. If you can tell me how tall they are, I can help determine how much fabric to buy. if you can give me your blanket dimensions (how tall by how wide) I can help you determine pockets and weight per pocket. If you would like to speed up the process, you could make the shell with a layer of quilt batting on each side. then all you have to do is add the pellets and sew. you eliminate the stuffing process and can make the channels any size you like. Hi many thanks for the really helpful tutorial. I’m just ordering the materials for this blanket which I’m making for my son who has autism and sensory processing problems. Could you tell me please approximately how much batting I would need in weight (the pull apart type)? I don’t want to order a huge amount! But also don’t went to have to order more. It depends on how big your making it. If it’s twin size or bigger, get 2 bags. If it’s smaller than twin size 1 bag if pull apart batting will work. I’m having a rough time with what size my blanket should be. It is for a 2 year old weighing 26 lbs. I’m afraid the size in this tutorial will be a little too big and she wouldn’t get the benefits of it being weighted enough. Do you have a suggestion for a blanket size? Thanks! So if you use a flat batting that gets sewn in, in the beginning, how do you pour in the pellets “cleanly”, without having them get caught up in the batting on the way down? Hey Cj! You are awesome! I was wondering since being in Az. I don’t think I want to put poly batting. Have you used the site and natural cotton batting? And if I make one for adults, what is a good size?so good to hear your voice!!! I have a question, we want to make a lap blanket that my granddaughter would be able to use at school. I know tht you said the weight for a full size blanket would be 10 per cent of their weight, but what would I use for weight in a small one like this. Hi, I am a new sewer but I can make this blanket. (Thank you for the tutorial btw) how much fabric for an adult? Or should I just Google twin sized blanket measurements? ( I just thought of that, I dknt want to sew a queen sized one) I just wonder how much fabric to buy. Thank you for that tutorial! I did not know it was going to be that easy! My adult daughter suffers from severe anxiety and she has been wanting one of these for a while now. As you had mentioned, they are expensive so this will be an amazing Christmas gift for her! I am kinda new to sewing so it will also be a learning project for me. I cant wait to give it to her. Thank you for making it so clear and easy to follow! Love and harmony to you and your beautiful family! Hey! I just finished a weighted blanket for my son – pleased as punch! Your tutorial was great! I used an old single duvet cover for the shell for the blanket… cheaper than buying material and a little less sewing! Thanks again! When figuring the weight of the blanket, do you factor in the weight of the poly fill and subtract from the needed weight of pellets? I never had factored in the weight of the polyFil. It’s so lightweight that it doesn’t add very much to it. I’ve never had it had more than a pound. Pleeeeeeease make one of these for me!!!! These are super expensive and i cannot sew. Please i can leave my email if you feel like contacting me. I am having trouble figuring the amount to use. So say the weight is 150 pounds what weight of beads should be used? My daughter is 21lb. Should I make it weigh just a little more sense she’s growing? How many beads should I use? You could make it a little heavier but I wouldn’t do too much heavier, max of 15% because you don’t want too much pressure on her even though she’s growing. One option would be to make it rag quilt style and as she grows you can add an extra “row” with the extra weight. You’d make “pockets” and sew them together like. I also sent you an email. Would anyone on this blog be willing to make me a weighted blanket & I’ll pay for the supplies and shipping to my house. My daughter suffers from PTSD Anxiety and Sleep deprivation. I am unable to do the things I’d like now due to having multiple back surgeries. Please email me if anyone on here would be willing to help me out. Thank you! Hi! I want to try to make a weighted blanket for my adult son who is having sleeping issues. I’m confused on the measurements for the pellets. He weighs 220 lbs. Could you help me with figures please? 10% of 220 lbs is 22 lbs. Help im making weighted blanket for my grandson needs to be 20 lbs hes a big guy anyways i cant seem to figure out how many oz I need i have 36 squars can you help me? This was really great. My 9 year old granddaughter suffers from anxiety and we are trying several things to help her. I have heard of weighted blankets and I would like her to choose the fabric and help make it. I appreciate the time and effort you spent in preparing the tutorial. Thank you! Yay! Have fun making it! Post a picture on our Facebook page when you’ve got it done! You are so welcome! Keep us posted on how it turns out! Post a picture to our facebook page when you’re done! Hi! Would minky material be ok to use for a weighted blanket? I just watched your video and got my answer! Great video thank you. Yes, any fabric will work but mainly will take a little more patience and skill. Hi and thanks for the tutorial. I’m making a double sized blanket and I have 60 pockets to fill. I calculated the weight of my pellets (15 pounds) x 16 ounces which is 240. This divided by 60 would be 4 ounces. Can I just use a half cup measurement or should I be weighing them on a scale? In theory that should work, but I’d check one 1/4 with a scale t make sure just in case! I bet you’re right though! I saw a pin where the blanket had pockets that closed with velcro, they filled with folded sheets. Potentially less costly, more washable. That would be less costly, worth a try! Yes, 2.5 lbs is correct. Take your 2.5 lbs and multiply by 16 to determine total amount in ounces. 40 ounces. Then take 40 oz and divide it by the amount of pockets you have. Example if you have 5 pockets across the top and 5 across the side You’ll have 25 pockets. 40/25= 1.6 oz I’m each pocket. Make sense ? Thank you CJ for your easy to follow and listen to tutorial on the weighted blanket. I just learned about weighted blankets on Pinterest tonight and have been looking for more information. I’ve sewn most of my life and recently made rice bags to heat or chill for necks and backs for family Christmas gifts. I struggle to sleep at night and have most of my 68 years. So, I look forward to making an adult size weighted blanket and pray that I will enjoy better sleep under it. Peggy M.
I hope you are getting great sleep with it! How did it go? Hello! Thanks for the tutorial, it was great! Could you post the dimensions and calculations (how many pockets, weight in pellets, etc.) for the blanket you made for your church friend? Also, what kind of material you used? Thanks so much for your help!!! I looked through my files and couldn’t find it, I am sorry! I can’t recall either! Excellent tutorial. Thank you so much! My grandson got a weighted blanket for Christmas and he absolutely loved it. It was on his wish list. Smart kid at 11 years old. I am so impressed with the idea of the blanket and your tutorial that I want to make one for my husband that suffers from anxiety! Ok I really would like to make several of these but I am not sure how big to make them. I understand the weight part just not sure on size. One child will be 3 soon and is about 3ft tall, the other is 3 1/2 and is 3ft tall. The soon to be 3 weighs about 31-32 lbs and the 3 1/2 weighs 28lbs. I would like to make them so they last for a little while. Can you make this for babies? You want to make the blanket about as tall as they are. One idea to make it adjustable to grow with them is to make a “Rag quilt” type, that way you can add extra weight in rows as they get heavier and taller. I’ve never made one for a baby, so I am not sure, but I’ve seen sleep sacks with weighted parts in them designed for babies! So maybe! What kind of crystals? This sounds intriguing! There are so many to achieve different things. But for instance, Amethyst is calming and healing, helps with sleeping and I use it for headaches, I would probably use clear quartz as well as it amplifies any crystal you use it with plus has healing qualities too. Rose quartz is a gentle, very loving crystal and gives unconditional love and very supportive emotionally. I guess I would be using them as chips as tumblestones quite lumpy. They are all non-toxic crystals so safe in that respect, some crystals can be toxic. Also some shouldn’t be washed as they can disintegrate but the three I have mentioned above are hard and would be fine in water.